Aly is a graduate from Kent State University with a degree in Zoology and minor in Psychology. She has interned at zoos and aquariums learning positive reinforcement training techniques and all about animal behavior. She has worked with a variety of species, including sea lions, dolphins, guinea pigs, bunnies, ferrets, parrots, gophers, pheasants, and porcupines. She has always had a dog in her life and helped train them in basic obedience and fun behaviors. Aly joined AAD in June of 2017 as a kennel technician, expanding to instructing private and group dog training lessons, daycare and bathing in the grooming room. Amanda is a graduate of Animal Behavior College (ABC) obtaining certificates in both Pet Grooming and Dog Training. ABC is approved by the Bureau for Private Postsecondary and Vocational Education and is an internationally recognized school. She is also an approved AKC Evaluator for both Canine Good Citizen and S.T.A.R Puppy tests. Committed to providing the most effective, convenient solutions to her clients’ dog training needs, Amanda likes to keep current on industry literature. She has instructed private lessons, puppy classes, basic & advanced obedience classes, rally & tricks classes and is experienced in training deaf dogs. Living on a farm she also brings the dynamic of training dogs around livestock. 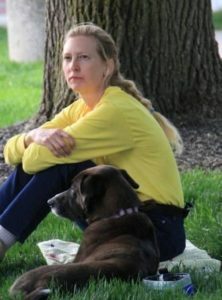 She has worked with community based organizations to train shelter dogs. 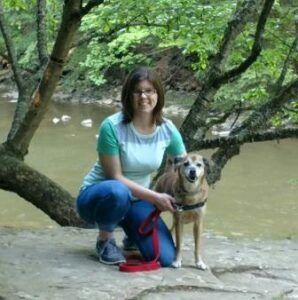 Amanda enjoys partaking in therapy dog visits with her Miniature Schnauzer and is a Licensed TDI (Therapy Dog International) Evaluator. Laura has been involved with dogs all her life. She got her first, Teddy, a Treeing Walker Coonhound, when she was 10 years old and she has grown from there. She participates in Agility, Hunt tests, Shows, Lure Coursing, FAST cats and Barn Hunt. She soon will be adding Dock Diving to the list. She is a licensed UKC Coonhound Show Judge, Assistant Agility Instructor and helps with the local 4-H dog group. Laura joined the All About Dogs team as a Kennel Technician in September 2015, expanding her duties to Taxi Driver and teaching group dog training classes. Laura was promoted to Dog Training Coordinator in August, 2018. I never had dogs growing up however I always had a love for them. When I was 21 and moved out of my parents house for the first time I got my first dog Max, a Puggle. After 5 years of just owning Max I came across a dog who was about to be euthanized due to biting someone in the shelter. She was a 3 year old Chiweenie (Chihuahua/Dachshund mix). I got to her and rescued her just in time. Once I adopted her I found she had a lot of fear aggression. I took a good year or so to rehabilitate her so she can live a relatively normal and happy life. I fell in love with the psychology of animal behavior vs human behavior and it fascinated me. I thought I have to do something with my life where I save those dogs who may not get a second chance. Immediately I thought dog training since it deals with animal behavior. I did some research on different training schools and came across CATCH Canine Trainers Academy. It took me just over a year to complete my schooling. In April of 2015 I became certified. My first job as a trainer was at petsmart and I happend to get this job right when I was in the middle of school in August of 2014. Throughout my training career I also became certified as an evaluator to conduct the cgc (canine good citizen) test back in January 2016. In my free time I also work with my own personal dogs doing agility. I just got hired here at all about dogs in February 2018. I am excited to expand my skills here at all about dogs and continue to learn more and be a part of this wonderful company. My passion in life is to keep dogs out of shelters and to rehabilitate those dogs who need a 2nd chance. Pam started working at All About Dogs in 2009 offering her Reiki and Canine massage services but soon she expanded her job responsibilities into the daycare. Spending time with the dogs and watching how they interact led her to learn more about canine body language and behavior. Being a regular in many types of training classes such as agility, Rally-O and obedience with her own dogs she felt the desire to learn to teach training classes and help other dogs and their owners build positive relationships. She mentored with a local trainer for over a year while continuing to read and learn all that she could. She has been teaching classes at All About Dogs since 2012. In December 2018 she was accepted as a Pets for Vets trainer. She looks forward to helping the Veterans of our area find a companion from local rescues and shelters.